When attending an exhibition, first impressions are crucial. 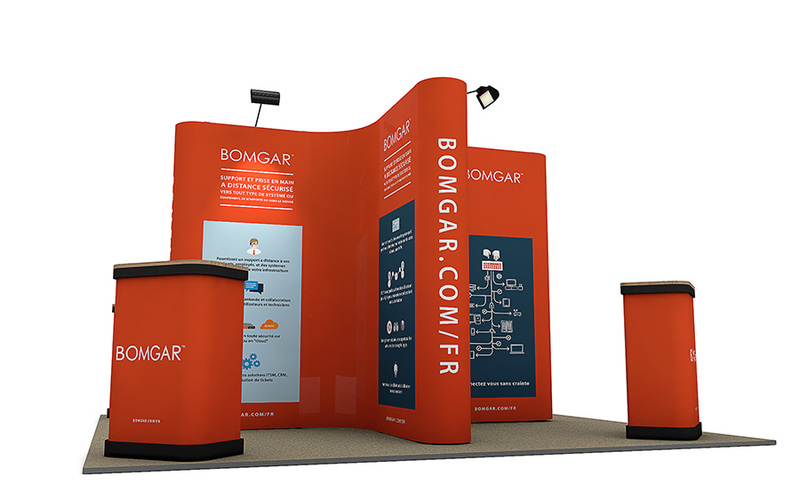 A professionally designed exhibition stand is an ideal start, and a great way of attracting potential clients and business leads. You never get a second chance at a first impression! Getting it right is important, for most companies one of the main reasons for exhibiting is to generate leads that ultimately result in profit for their business. Exhibiting is all about capturing the attention of the audience, and the trouble is you’re not the only pop up exhibition stand at the show. It’s about how your stand captures the visitor’s attention over your competitors. Your stand needs to be the big impressive stand that has the wow factor. Follow our exhibition tips and advice and visitors will naturally gravitate towards your stand. ye catching design. No one wants to visit a bland exhibition stand with poor design and no features. The design of your exhibition stand will ultimately determine whether or not your audience will simply walk on by your stand, and most likely towards your competitors. A professional look and eye catching design will result in your stand being spotted from a distance, and will draw in passers-by. Once you’ve initially drawn them in then it’s up to you to keep them there, whether you do so with free gifts, competitions or simply your expert advice, that’s up to you. Remember the average exhibit visitor only stays for 30 seconds to 3 minutes, so make the most of your limited time. Be prepared but don’t read from a script, there is nothing more off-putting! If you’re thinking of getting one of our designers to create a design for you then here is how your design will be handled start to finish. Our designers will then go ahead and create a concept for your artwork following your brief and brand guidelines. Once a first draft has been completed an artwork proof will be sent to you, this is your opportunity then to add, remove or change any of the design features. We are always happy to make amendments to the design if required, and this proofing step allows us to ensure the end result exceeds your expectations. Once the final proof has been signed off by you then the design will be sent to print. 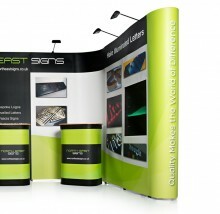 We print and manufacture all our printed pop up stands and banner stands in house. We have full control over the quality of each printed product, and we always pre-assemble your exhibition stand to guarantee the product quality is to the highest standard. Aside from the design of the stand itself, accessories are another great way to make your exhibition stand catch the audience’s attention. For example lighting is important as it highlights and compliments the design of your stand perfectly and helps to bring out the colours. Correctly positioned lighting can be the finishing touch your stands requires. No stand lighting will result in your stand looking dull and in comparison to your neighbouring stand, simply rubbish…even with a great design. Ultimately the design is important but without accessories you exhibition stand could still fail. If you have the budget, use media! TV monitors are a great way to give your stand some movement and vibrancy that your competitors lack. With this kind of media a whole world of interactivity opens up to you, presentations and videos can be played back via your screen. You could even show a live Twitter feed and post about your presence, this will encourage visitors to do the same. It will not only generate some free publicity but you are generating traffic through to your Twitter account so effectively your killing two birds with one stone. Everyone enjoys seeing their name in lights! Another great interactive marketing tool that will generate ways and means of keeping your visitors attention for just that bit longer is an iPad stand. Lock your iPad on your website, this allows visitors to browse what you have to offer. Finally, your stand might look impressive but your stand staff need to comply to the professional look too. The dress code needs to be professional and kept in line with your stand. Branded clothing will means your staff and brand can be recognised by all around the show, even when you’re not manning the stand. Brand visibility is important! If you’re stuck for ideas on how you’d like your exhibition stand to be designed, we have a Pinterest page that contains a vast bank of images of pop up exhibition stands we have designed for our clients. Many of our clients visit and follow our Pinterest page to keep up to date with our latest design work. At XL Displays we offer a graphic design service for pop up stands, banner stands, branded tablecloths, outdoor displays and bespoke exhibition stands. The cost of a graphic design service will depend on your requirements, contact us or call for more information 01733 511030.